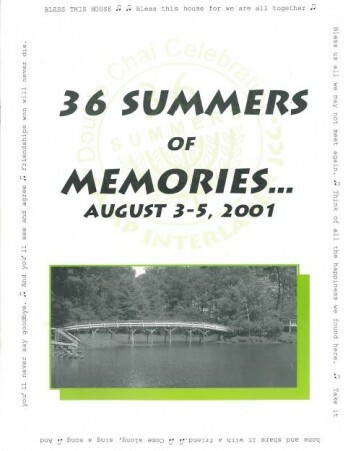 On this Fiftieth Friday we are flashing back 13 years to the “Double Chai 36th Celebration” at Camp in 2001! Visit the album on Facebook (link at bottom) to check out all of the fabulous pictures from the memory book, and feel free to tag all of your friends! We are making one of these books for the 50th and need your help collecting all of your favorite Camp photos! Please send in your pictures to our photo submission. For many of you, 2001 was the last time you saw Camp. We can’t wait for everyone to be together once again in June to celebrate the successes of the past 50 summers, and to get excited for our next 50 summers! We are almost at 200 registrations for the event. There are only three weeks left to receive early registration pricing, so secure your spot at the event TODAY by clicking HERE! Click HERE to view the “Double Chai” memory book on Facebook!